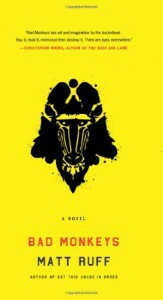 A friend recommended Bad Monkey by Carl Hiaason but I picked up this one mistakenly. It started out fun but by the end I was so lost. I like different but this was very very different. Its starts off with Jane Charlotte's arrest for murder. She tells the police that she works for a government agency. They put her in a mental hospital. And that's the beginning of this very bizarre story.